So…clinics. 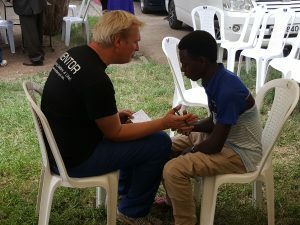 Our mission here with Vision for Kenya/Vision for Africa is to share the gospel as we hold free eye clinics for the people in underprivileged areas. Some teams head out into the villages, some teams (like ours) work in more urban settings. The church we are partnered with is Pipeline, an ELCK church that is located in the Mukuru slum. Although the people acknowledge they are poor, the church members consider themselves all very rich. Throughout the work we’ve done so far, they have been outstanding partners, even having some of the women bring lunch for all the workers each day. For the second day, I worked the reading glasses table. Each person coming to the clinic gets a registration card, then follows a path through the clinic, depending on their needs. 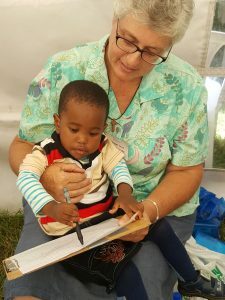 They open at the evangelism tent, where they hear the gospel story, and from there proceed to have a basic eye chart check to establish their vision level. Those who have bad vision are marked as such and either sent to the autorefractor, or noted to be seen by the doctors. Each person is then sent to triage, which you can see across from my table. 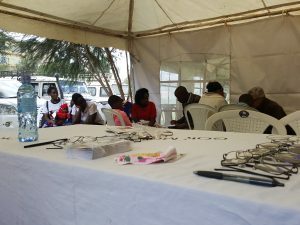 Two or three team members take patients one at a time and ask what their eye problems are, to get a better idea of what they need, and then the triage team member will ask the patient if they have any requests to pray with them. For those of you who know me, this is a bit outside my comfort zone, but even I did a little triage when we got busy. much better, as there are no limits on car exhausts and other things that add to the smokiness of the air. A lot of people have come through complaining of light sensitivity or tearing eyes, and they get eye drops from the doctors. For those who need more vision correction, those we are able to help get sent to the glasses table to have distance glasses made for them. Some we have ready made, but some require assembly to get the correct prescription. Usually Dave or Pastor Kevin will make the glasses for those who get to this station, as the frames are a little tricky to handle – the lenses we were shipped this time are slightly too large, so assembly has to be done carefully. The beautiful young lady in this photo had the most amazing smile when she discovered that she really could see distance objects clearly. All in all, it’s been a successful couple of days. 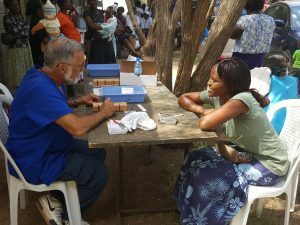 We may not have seen as many patients as we hoped, but we’ve had over 500 come through the clinic so far. Word of mouth is a very big thing in the slums, so hopefully more will come as the week progresses.